When weight disappears, the fat has to go somewhere. Our endocrinologist explains exactly where that is. What happens to body fat when you shed pounds — do you sweat it out, pee it out or breathe it out? The answer is yes, yes and yes. How on earth does this happen? 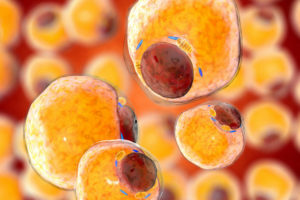 “It helps to understand that our bodies are designed to store excess energy in fat cells,” says endocrinologist Bartolome Burguera, MD, PhD. If you’re carrying extra pounds, it means you’re taking in more energy (calories are units of energy) than you’re using. “The extra energy is stored in adipose tissue all around your body in the form of triglycerides,” says Dr. Burguera. Smaller amounts of energy are stored in your liver and muscles as glycogen. When you’re active. Your muscles need energy whether you’re only getting up from a chair or running a marathon. When you’re eating. Your digestive system needs energy to break down and store food. What happens to body fat when you diet? When you diet, you take in fewer calories than your body needs. Because of this deficit, your body turns to fat reserves for energy. Your body must dispose of fat deposits through a series of complicated metabolic pathways. As water, through your skin (when you sweat) and your kidneys (when you urinate). As carbon dioxide, through your lungs (when you breathe out). What happens to body fat when you exercise? Experts recommend at least 30 minutes of cardio two to three times a week. They also recommend weightlifting and resistance training. Increasing muscle mass may help you burn more calories and raise your basic metabolic rate. Exercise also increases your respiratory rate, so more CO2 leaves your body when you work out. “Exercise is key to weight loss and to maintaining that weight loss,” says Dr. Burguera. But it may take time to move the number on your scale, so be patient. Everyone’s response to exercise varies: Some people lose weight, others maintain it, and a few may even gain a few pounds.